Stephen Harper and Tony Abbott together took a hard line Monday against measures to limit the emissions that cause climate change if there's a threat those measures would hurt their countries' economies. Harper told reporters that Canada is simply more frank about its position on climate change than other countries. The Canadian and Australian prime ministers, who praised each other's policies and called each other by their first names, met in Ottawa as Abbott stopped in on his way to Washington, D.C.
Harper told reporters he feels the same pressure "that we all feel" to make progress against climate change, and said measures taken by U.S. President Barack Obama don't go nearly as far in the electricity sector as Canada's measures. 'No matter what they say, no country is going to take actions that are going to deliberately destroy jobs and growth in their country. We are just a little more frank about that,' says Prime Minister Stephen Harper. (Adrian Wyld/Canadian Press)"It's not that we don't seek to deal with climate change. But we seek to deal with it in a way that will protect and enhance our ability to create jobs and growth, not destroy jobs and growth in our countries. And frankly, every single country in the world, this is their position," Harper said. "No matter what they say, no country is going to take actions that are going to deliberately destroy jobs and growth in their country. We are just a little more frank about that, but that is the approach that every country is seeking." Abbott said the world should do what it reasonably can to limit emissions and man-made climate change, "but we shouldn't clobber the economy." "And that's why I've always been against a carbon tax or an emissions trading scheme because it harms our economy without necessarily helping the environment," he said. 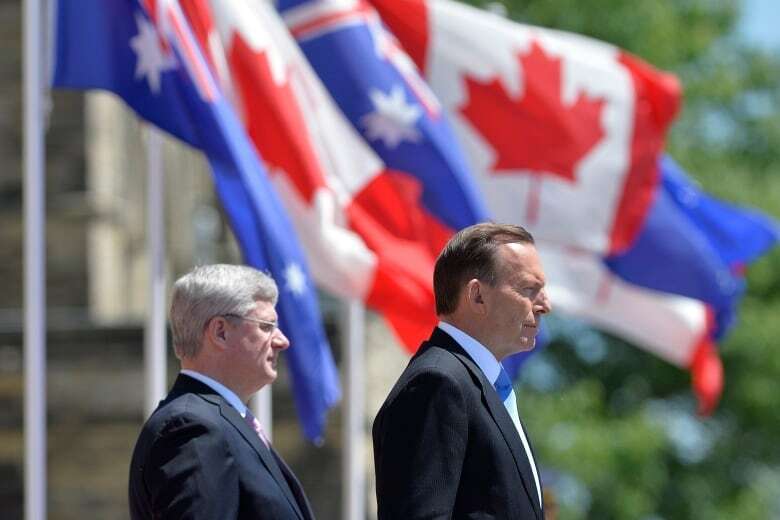 Harper praised Abbott for his work as chair of the G20, as well as for ending Australia's carbon tax. "You've used this international platform to encourage our counterparts in the major economies and beyond to boost economic growth, to lower taxes when possible and to eliminate harmful ones, most notably the job-killing carbon tax," Harper said. Harper also took an indirect shot at Liberal Leader Justin Trudeau, saying Harper and Abbott know that budgets don't balance themselves. Canadian Conservative MPs jumped on Trudeau last February after Trudeau said economic growth would mean "the budget will balance itself." Abbott and Harper praised each other, with Abbott telling reporters that Harper has been a guide to centre-right politicians around the world. Abbott arrived in Canada yesterday for a two-day visit before heading to Washington. Harper greeted Abbott on Parliament Hill Monday morning for a sit-down meeting in the Prime Minister's Office, and the two leaders spoke to reporters just after noon ET. Abbott says Harper has been a beacon to centre-right parties around the world and he calls him "an exemplar of a contemporary, centre-right prime minister." Australia is embarking on a series of austerity measures to try to balance its budget and Abbott says he hopes to learn from Harper's experience in whittling down Canada's deficit. Harper has said Canada is on the verge of balancing its books and Abbott calls it a significant achievement in the face of a $55-billion deficit in the wake of the 2008 economic crisis. Abbott also met Gov. Gen. David Johnston and took part in a roundtable discussion with business leaders from Canada and Australia before he met with Harper on Parliament Hill. Harper and Abbott will speak at a dinner Monday night at the Château Laurier hotel in Ottawa.